In a recent entry highlighting Jimmy Durante's 1964 novelty song, "We're Going UFO-ing," I said that humor is often a routine human response to way-out issues such as UFO evidence. In fact, before humor even enters the race, the skeptics and debunkers usually climb aboard to discredit or explain away bizarre incidents and the people who report them. We can look at this kind of response as not a cover-up, but as an all-knowing, fatherly or big brother take-charge attitude among those who absolutely feel it their obligation and duty to get out there and reassure, soothe and calm an anxious public. Whatever seemingly plausible instant explanations can be thrown and are able to stick on the wall of public inquisitiveness -- ANYTHING to anesthetize inquiring minds of the masses -- are fair game. I don't know if UFOs (or unlikely government experiments) have anything to do with mutilations of cattle and other animals, but a number of investigators have curiously embraced or contemplated a UFO connection since the sixties. 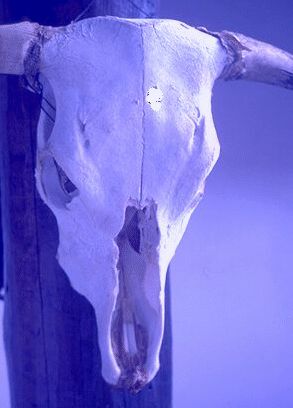 Thomas Adams of Texas was on the trail years ago and churned out some interesting documentation, and international researchers have followed mutilations closely, especially in South American countries. However, the person most quoted about mutilations in the U.S. is probably journalist Linda Moulton Howe, who has exerted a firm grip upon these incredibly strange events since the seventies. Yes, she has her critics (you might check out the UFO Watchdog Web site -- see link -- for a few comments about her), but overall I think she has performed some worthwhile work regarding some very creepy things -- mutes being high among them. The headline shown here hails from a November, 1975 UPI story, and looking at the mutilation situation 35 years later I believe it's accurate to say, wow, look how far we haven't come. I say that because the article, in a predictable attempt to quote "experts" who suggest or explain away animal mutations as normal, draws heavily upon theories about disease processes and natural predators causing disfigurement, and novice law enforcement personnel too inexperienced to interpret mutilations accurately are also conjured. Even cattle ranchers receive a thrashing, accused of manipulating animal death information in order to fraudulently obtain payoffs from insurance companies. The peerless jury may still be undecided about mutilations, but one component apparently remains rock-solid 35 years later. The 1975 newspaper story referenced a number of rewards being offered in several states for information leading to arrests and convictions of "witchcraft" cultists or others responsible for animal mutilations. Well, the decades have passed, mutilations continue and their bizarre qualities have heightened -- and still, not one person, not one reward, has been claimed. If those responsible are apparently untouchable, the reasons why lead us to some extremely interesting and alarming speculation. Or, to quote the familiar, some nights just aren't fit for man nor beast -- the latter in particular. NAUGHTY WORDS FROM A CRANKY AND IRRELEVANT U.S. CITIZEN: Yeah, I know, I'm just a legal citizen and my opinions don't matter a lot to Congress or White House minions and other high-ranking government "representatives" harboring their own untouchable agendas. Nevertheless, I just want to NOT thank the president of Mexico for coming to my country and insulting and condemning Arizona's legislation (essentially mirroring U.S. laws already on the books but, pathetically, not enforced) in reference to illegal border-jumping folks who come here from (and through) his country at will, costing taxpayers billions of dollars and jobs. Hey Jack, we don't need your finger-pointing -- we in the USA already have a president and his associates who criticize and apologize for our country every chance they get, particularly during overseas travel, in order to please world leaders by representing us as a nation populated by buffoons, racists and inanimate douche bags. Further, Mr. Mexican prez, you already know that your country's illegal immigrant legislation is brutal and many, many times tougher than ours. Amazingly, your comments also seem to indicate that we shouldn't be sending your own people back to you -- you don't want 'em, either! How dare you! Well, I just hope you enjoyed the extravagant hospitality and dinner my president gave in your honor (had I catered, the bill of fare -- commonly known in America as a menu -- would only have included soy hot dogs, Spaghetti-O's, string beans and marshmallows for desert) because the American people shelled out considerably more for the festivities than they enjoy in their personal lives so that you could go to bed un-hungry and idiotically outspoken via what delicately remains of First Amendment rights in our land. True, I want my country to help you clean up your country and assist in helping the kind and wonderful citizens of Mexico to find a better life south of our border -- yet, I wonder, just what national U.S. riches did my president promise to give you toward that effort? Surely, you didn't visit the White House -- and Congress -- just so's you could eat and run, did you? And here's more. . .
BEWARE, ARIZONA: I know, it seems like a miracle -- President Obama is sending 1,200 National Guard troops to the borders. . .but wouldn't it be funny (just a thought) if he's sending them to hinder the legal process once the Arizona illegal immigrant law goes into effect? If it does. Seems to me that political Washington geeks of both parties have gone out of their way to do little about the border -- why now? Why now is because "they" don't want the Arizona law put into force. Watch out, Arizona -- there's no agenda like a political agenda. And here's even more. . .
AWASH IN OIL: Before directing fire, brimstone and utter condemnation toward BP and other oil companies, we need to step back and realize that pretty much each and every one of us makes use of petroleum-based products in some manner -- so, in a way, we're all at fault for the Gulf Coast horrors. This doesn't negate the scope of the tragedy, nor lessen the profound meaning of animal life lost, but face it -- we humans are what we are, and that's not a compliment. By the way. . . TERRORISTS DOING THEIR THING: Our government appears ever more intent upon trying to divorce the word, terrorism from the terms, Muslim extremists, radical Islam or Islamofascists. Distortion of the truth seems to be an ever-sharpening tool used by this Administration, by this White House, and that's just plain dangerous. Just ask the victims of Islamic extremist law -- including Muslims themselves -- who know better. Bad enough that the FCC wants the gov to take over our Internet by decreeing it a "utility," but to try to "re-educate" us into believing that radical Islam just doesn't exist puts us at ultimate risk. Radical Islam is already taking a toll on Europe (incidentally, take a look at Holland), and if our open society ever becomes similarly accommodating, we're finished. As always, beware the lies and beware the enemies within. -- Lyrics from "We're Going UFO-ing"
Ever since "flying saucers" captivated public interest in the forties and fifties, cartoonists and humorists have enjoyed a galactic field day. Between 1964 and 1966, when national UFO activity became prominent with dramatic overtones, the funny saucer/aliens/space invasion stuff in newspapers, magazines, TV and radio blossomed. As might be expected, this trend wasn't at all comforting to serious UFO investigators, forced almost daily to beat away the laugh factor with a stick while pleading with the public to consider UFO incidents earnestly. Nevertheless, it's human nature to dive deep and fast for humor when confronted with potentially dangerous or just plain weird intrusions into our supposedly normal lives -- and laughter triumphs over feel-good drugs almost every time. A few days ago, I mentioned a novelty song performed by the late actor/comedian/singer Jimmy Durante -- an immensely talented performer of both motion picture and television fame (he had his own weekly network show in the fifties), whose trademark was his large nose and a very notable voice. I'm acutely aware that some of you, perhaps most, won't recognize his name because, well, because fame truly is fleeting, and today has a way of replacing all the yesterdays with lightning speed sometimes. At any rate, Durante was 71 years old in 1964 (he died in 1980 at 87 years of age), when the Socorro, New Mexico (alleged) UFO encounter and a host of other close-up UFO incidents (with apparent ground evidence associated with various cases) began to be picked up by the national press. At some point during the brouhaha, Jimmy made a quickie novelty record, added to one of his LP record albums, entitled "We're Going UFO-ing." I erroneously called it, "In my UFO" previously, but hadn't heard it or thought of it for so many years that the real title escaped me until I looked it up. I do remember that the song turned up without warning on, especially, AM radio stations (whose sole reason for existence in the sixties was usually to play music and sponsors' commercials, with a dash of disc jockeys and news thrown in for good measure), played for a few days and then seemingly disappeared forever. But this is the Internet Age. Today, you can visit one of many sites to hear and, if you prefer, even purchase a download of this brief 2:28 minute recording. Durante and his orchestra sound superb in stereo, the lyrics are few and, like it or not, "We're Going UFO-ing" is "one of those songs" (to quote another Durante song favorite) that stays in your head by way of its own catchy melodic simplicity. Yes, the song works, and while its release did absolutely nothing for serious UFO research in 1964, the darned thing may have been what the country needed as strange UFO "bombshell" incidents came to light all over the country and all over the world. You know what? If the day ever comes in this country when we have UFO "disclosure" and, according to the opinions of some, people begin to panic in the streets and start eating their neighbors and initiate the wearing of tin foil hats and wolfs bane, this is the song I want blaring out of loudspeakers on military vehicles as the government tries to maintain calm and sanity (ha, good luck with that). Anyway, thanks for the comedy, Mr. Durante -- and, not to forget, goodnight Mrs. Calabash, wherever you are. 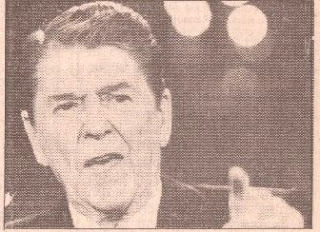 Reagan Knew, How About You? Remember those things that should never be forgotten, such as these goodies from the 1980s. To read in depth about President Ronald Reagan and UFOs, visit Grant Cameron's Presidential UFO site (see link) and go specifically to the Reagan page. What with an epidemic of earthquakes, volcanic activity and disastrous oil spills (and, not to forget, climate change and national economies and back-stabbing political parties in tatters), I almost lost sight of the fact that this is also a joyous time of college graduations, high school proms and graduations, and teenagers both partying and driving badly -- for the last time ever, in some tragic cases. As far as the eye can see, catastrophe seems commonplace: A paucity of good jobs for graduates; graduates who can neither read, spell nor add; illegal immigrants (rock on, Arizona, good for you!) and Islamic extremists with mayhem on their minds (our U.S. attorney general can't even bear to call them what they are, preferring instead to dance around the fitting words, Islamic terrorists, when questioned by Congress). As I write this today, a radio broadcast blares with news about a new scientific study linking pesticides in food to attention deficit disorder (not that it's ever a good idea to spray lawns with pesticides, either, because kids, pets and wildlife are obviously an unintended target of this variety of better-living-through-chemicals -- but is this truly a surprise?). What else. . .oh yeah, and divorces account for terminating more than one in two marriages now, all because of relationships endured by people who promised to love and cherish one another "forever," and instead end their blissful togetherness in fights, spousal homicide or murders of one's own children (if abused children don't take out mom or dad first). Not to mention the up-and-coming troubled or bored teens consistently plotting to blow up their schools, when just hoping to eradicate bullies or personal demons isn't quite enough. Well, I thought this would be an appropriate opportunity to remind one and all not to worry to excess about these current, potential and ongoing natural/unnatural disasters. Remember: The dinosaurs probably thought their offspring were the hungry future, too (and don't bother hiding under the covers, under the bed or under anything handy -- when that Big Rock Candy Mountain in the sky arrives, it's all over, and all that stuff your mom said about wearing clean underwear in case you get hit by a bus and rushed to a hospital need not be a highlight of your daily lives). Yes, young folk, if you must panic over something -- and who shouldn't these days? 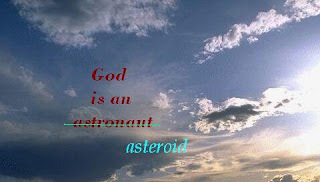 -- choose the fear of giant asteroids, those uncommon, yet in-your-face equal opportunity annihilators of the universe. Sooner or later, like census takers, they're sure to stop by to crash the party, albeit without drugs, alcohol or iPods. So have fun, kids, and don't worry about the little things! 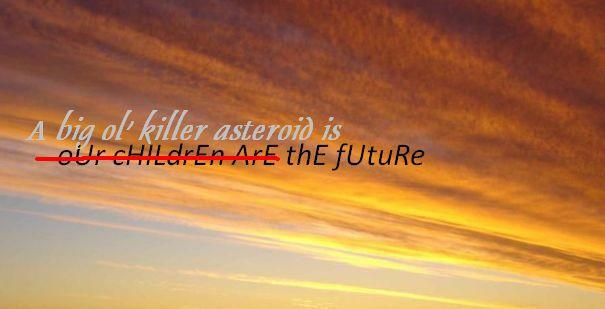 You are the future, and all the growing horrors of the future are yours to embrace! At least, um, for a while. 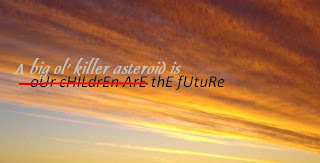 Sometimes they're meteorites and sometimes they're space junk. Sometimes they're plane crashes or balloons, and sometimes they're secret government projects you'll be chased away from. And sometimes they're strictly visual without apparent substance. Still, you know you saw something. But where did it go? What was it? Dramatic, well-publicized UFO cases often seem impressive, but what about the rural incident which seems so insignificant, a mere blink in the night? When multiplied all over the globe by the thousands, do such events hold a special meaning? Back in mid-April of 1994, at least four people reported observing something strange over a cornfield in the northern New York community of Oswegatchie. According to Associated Press reports, witnesses reported that something fell out of the sky around 8:15 p.m. -- that the fallen something had one or two rows of bright red lights and "flew over a cornfield" before it dropped straight down into that cornfield. Observer Steve Ponko, outside, said "There were one or two rows of red lights. . .sort of shaped like a plane. It was coming toward me. . .all of a sudden, it dropped into the field." A border patrol agent and two women in different locations nearby also called police to report the strange sight. Though dozens of volunteers and an infrared-equipped (for night vision) Army helicopter from nearby Fort Drum were dispatched, searchers found nothing (or so we are told). "We don't know what it is," explained Kit Smith, district fire coordinator. "From what we were told, it did not resemble any type of conventional aircraft." Smith added that neither Ogdensburg International Airport nor the airport in Burlington, Vermont reported radio transmissions from incoming aircraft at the time. Something or nothing? Yes, sometimes mysteries pulsate in hues of icy blue, as if cold and calculating, and sometimes they reflect against the evening sky in shades of jade green. At other times, they arrive innocently in sparsely populated areas, dressed informally in rows of crimson, here and then gone, perhaps manipulating time and space to their advantage. To whose advantage? We marvel, then dismiss the little things easily, finding no importance in those brief, yet ubiquitous shining treasures of the night. Why wouldn't we wave them off, if implications for the bigger picture are incapable of personal assessment? 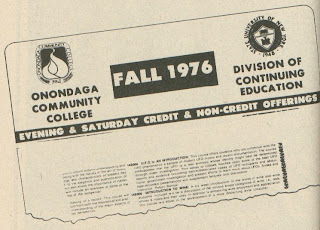 Not to be inhospitable or crankier than usual, but I don't know why so many members of the world press went bonkers over Philip Haseley, the Niagara County College anthropology professor (and MUFON representative) who recently stated that the UFO subject should be taught at the university level. I mean, I'm glad he received solid publicity and said what he said, but my question is for the media: Didn't those folks know that both credit and non-credit college UFO courses have been around for years? The late Dr. J. Allen Hynek, former Air Force UFO consultant, taught students about UFOs for credit, as do Dr. David M. Jacobs and other professors. The late and somewhat under-appreciated (re his UFO research) Dr. Harley Rutledge also comes immediately to mind, and we're just talking about the U.S. collegiate scene. 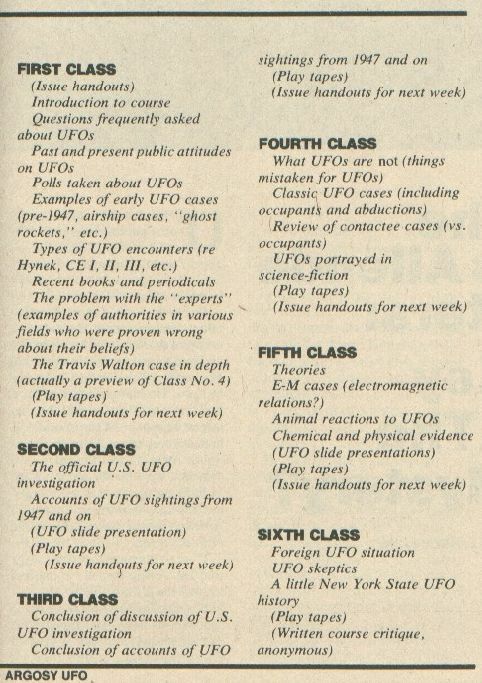 Even Prof. Haseley reminds us that such courses have existed, and of course his main point is that the UFO involves scientific study fit for a college classroom. 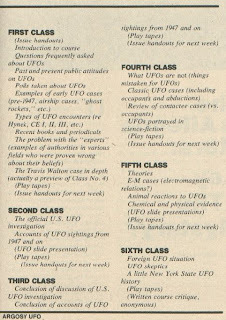 As mentioned in an early blog post here, I began teaching several sessions of a non-credit introductory UFO course at a college in 1976, eventually wrote about it for the magazine, Argosy UFO, and received lots of mail -- a significant amount of it from people looking for guidance to teach their own college classes on the subject. 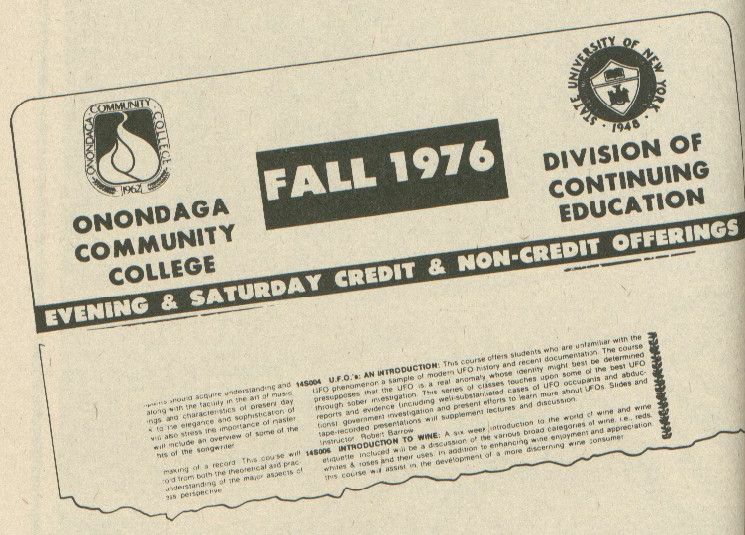 One of them, Christopher Centi, an investigator for the Aerial Phenomena Research Organization (APRO), developed a popular course at Jamestown (NY) Community College which received fair news coverage following its inception in 1977. We wish Professor Haseley much success as he embarks upon teaching his own UFO course -- for college credit, we assume -- because the need is there. But for every college professor willing to offer legitimate UFO information, there are probably 10 or more colleague-debunkers waiting in the wings, ready to annihilate his or her reputation without so much as a glance at the facts. Sometimes, we conveniently overlook contradictions in order to proclaim our own shallow victories. Take UFOs, for example. There are still people out there who insist UFOs are real, but must be an invention of ours, super-secret devices with abilities far beyond anything known overtly to conventional science and aeronautics. That's nonsense, of course, because even a cursory review of the better UFO cases presents us with anomalies generally far removed from any presumably rational human thought or interpretation. When we devote time and effort to thinking about the phenomenon/phenomena, whether scientists or laymen, UFOs simply drive us nuts. That's why some folks comfort themselves by stubbornly asserting that UFOs are man-made, relieving a lot of mental pressure. I'm not surprised, therefore, when so many people believe that humans have caused intense and damaging changes in climate -- and will forever refuse to believe otherwise. Don't get me wrong, I entertain certain impressions that we do cause damage, merely because of our numbers on the planet. Wars over fresh, clean and mere traces of water, for instance, will escalate in the future -- a dilemma which wouldn't exist without billions of humans attempting to claim the treacherously minimal fresh water reserves readily available on Earth. Now, we witness the ongoing BP (British Petroleum) oil leak tragedy, already deadly to humans on the platform and potentially catastrophic to all sea and land life for miles almost inconceivable. Unfathomable? Yes, some rational minds and folks engaged in the serious business of wishful thinking would prefer that all oil drilling cease immediately, never to return. That won't happen, however, because the world still depends upon petroleum and simply must because currently there's no comparable substitute in quantities demanded by an oil-hungry world. One cannot lubricate the vast intricate mechanisms of the working world with windmill power or solar panels. The reality? In the immediate future and probably beyond that, we're screwed. Oil isn't going away and, if nothing else, we in the USA know very well that China, Russia, and a litany of other nations with petrol-thirstiness unbounded aren't exactly weeping over our likely coastline devastation and packing away their drilling equipment. Whose fault? Their fault. Our fault. Nature's fault. One of those things. Drooling over signage on Earth Day isn't going to help, either, and we may as well let political EPA hacks continue sleeping off their appointments and regulatory powers 'cause waking up and seeing clearly is so beyond the pale. Contemplation. Petroleum comes from the planet, not from some laboratory specializing in squeezing oil from monkey livers. Like volcanic clockwork, one wonders how many times in a millennia the earth's own natural fountains have blasted petroleum into waters teeming with life, murdering creatures with killer crude, a substance destined to become the future human civilization's black gold. Oh yes, it's a mysterious planet, all right. One need only reference the many books published by William R. Corliss at The Sourcebook Project (there is a Web site), extensive collections of scientific newspaper, magazine and journal articles gleaned from the past which question things we think we know, enigmas still unexplained and planetary cataclysmic events. Gaia, well, she's not always in a festive Disneyland mood, it seems. Leery I am of those who profess that no crisis should go to waste. The oil disaster will propel them, energized like killer bees in the hot sun, to blame human activity for every ill on the earth, and CO2, though unrelated to the latest petro-calamity, will be portrayed as public enemy #1, surpassing even Iran's throwback knuckle-dragging dictators as a major threat. That's why I find this the perfect moment to return to a news report from March 30. BBC News quoted Professor James Lovelock -- the very architect who developed the idea of Gaia -- who assures us that it's too late to "save" the planet. Believing climate change unpredictable, Lovelock warns that scientific models can't possibly tell us the future. Scientists, the 90-year-old says, have gone from seriously investigating data to "fudging" information. Even if humans did have a hand in modern climate alterations, he asserts, there's really nothing to be done about it, and basically we should just enjoy our lives while able. Trying to save the planet, according to Lovelock, "is a lot of nonsense." Society appears to thrive more than ever on nonsense, but if Lovelock is refreshingly correct, can't we at least learn the truth about UFOs before we move on, giving up our place in evolution to the next sloth?